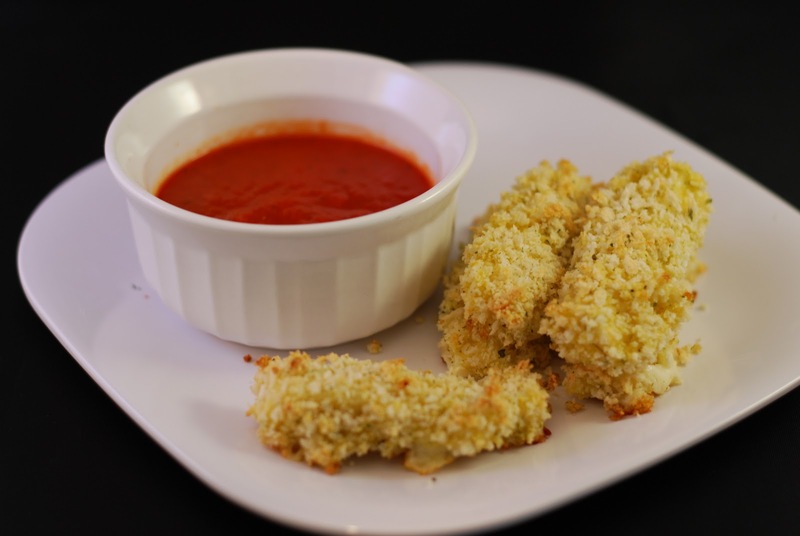 Mozzarella cheese sticks are pretty high on my favorite appetizers list, however I rarely get them when we go out. The hubby isn't really in love with them and then that would leave all of them for me to eat, which would end in both of us looking at each other in disgust. When I had a craving for cheese sticks one day, I decided that I could make them at home and even better, bake them. Now, I'm not going to say that these are exactly like the cheese sticks that are deep fried to a golden, crispy, ooey, gooey delicious-ness that you find at the usual restaurant. However, they do hit the spot when you have a craving and they don't leave you feeling disgusted that you ate 2 (or more). Preheat oven to 400 degrees. Lightly grease a medium sized baking pan with foil. In a large shallow bowl, mix together the breadcrumbs, oregano and garlic salt. Place the flour into another small bowl. In another small bowl, beat the eggs and water together. Cut the mozzarella cheese into 12 sticks approximately 2 3/4 inches in length. Dip the cheese sticks in the flour, then the egg mixture, then the breadcrumb mixture. Repeat dipping in the egg and breadcrumb mixture to ensure a complete coating. Arrange cheese sticks on the baking pan. Allow the sticks to set for 30 minutes. Bake in the preheated oven about 8 minutes until cheese is soft and sticks are lightly browned. I will have to try this... I like mozz & panko so I'm sure this will hit the spot without the pricy guilt when you order it and eat it all or leave it in disgust. These sound delish! I would like to have some of these while watching the Oscars! Wow this BAKED CHEESE STICKS are looks delicious. Baked cheese sticks Looking so Delicious. That is really so amazing Nad so Delicious. Thanks for sharing with us.